We don’t yet know who will be throwing passes for the Ducks come fall, whether it be Vernon Adams, Jr. or Jeff Lockie, or even someone else, but we do know who will be catching them. The University of Oregon has never been known for its talented wide outs, but this year could change that. Byron Marshall hauls in a pass against Ohio State in the National Championship game. This is the first in a long time, if ever, the Ducks have had NFL level receivers at every wide out position. In the slot, we have senior tailback-turned-1000+ yard receiver Byron Marshall next to the veteran speedster, Bralon Addison, with either Devon Allen, Dwayne Stanford or Darren Carrington lined up opposite of him. All of which have the talent and potential to become contributors at the next level. The wide receiver position for the Ducks in 2015 is arguably the deepest and most talented position on the team — if not the nation — given the experience and youth of this group. The injuries to Addison and Allen in 2014 were almost a blessing in disguise for the Ducks because it forced some of the younger guys to get more playing time, making this position one of the most experienced groups on the roster. *Addison’s stats from 2013 season, as he was sidelined in 2014 due to injury. Darren Carrington working in space against Florida State. With those resumes, it is pretty easy to see why this is one of the most, if not the most talented stable of wide receivers the Ducks have ever had. Not to mention incoming 4-star recruit Alex Ofodile and redshirt freshman Jalen Brown. The Ducks have turned one of their perennial weaknesses into one of their greatest strengths heading into 2015, which can only bode well for whoever lines up under center come September. 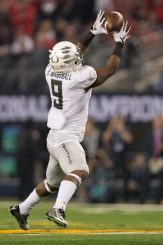 If you’re looking for a testament to the depth of this group besides sheer yardage, receptions and touchdowns, look no further than Oregon’s former receiver-turned defensive back Charles Nelson. Nelson was mainly a special team’s ace for the majority of last season, but as injuries began to take their toll, Nelson saw some time as a wide out and caught 23 passes for 327 yards and 5 TDs. He even led both sides of the 2015 spring game in receiving with 144 yards and 2 TDs. 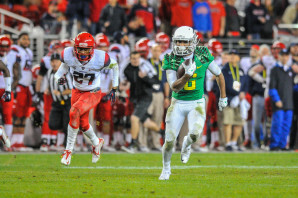 Charles Nelson running away from Arizona defenders in the Pac-12 Championship game. Granted, Nelson’s talents were probably more greatly needed in the defensive backfield after the loss of both starting cornerbacks to the NFL, but his change to the defensive side of the ball shows the amount of confidence the coaching staff has in its stable of receivers in 2015. One thing is for certain, if Mariota’s successor stumbles in 2015, it will not be due to a lack of talent on the outside. Alex OfodileBralon AddisonByron MarhsallCharles NelsonDarren CarringtonDevon AllenDwayne StanfordJefff LockiePosition DepthVernon Adams Jr.